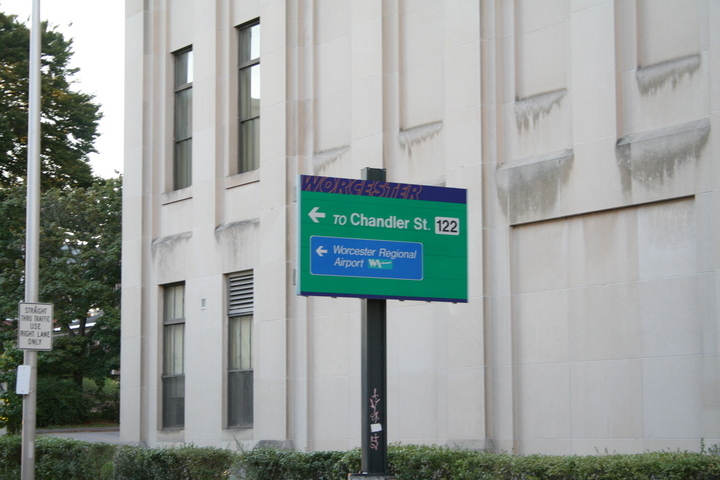 Worcester, like a number of Massachusetts cities, was briefly infected with a mania for European-style guide signs. In the abstract, they're not bad, but they are different and non-standard, which makes them less useful than an MUTCD-compliant sign conveying the same information. The whole reason for having the MUTCD in the first place was so that motorists would not need to learn a new “vocabulary” in every community they visited. Standard signs would be safer, although in the stop-and-go traffic of city streets it matters less than it would on a major arterial.